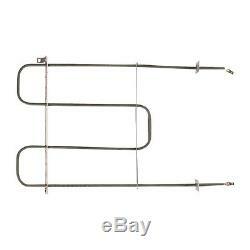 Genuine Y04100015 Jenn-Air Range Element Broil. Part Number Y04100015 replaces 04100015, 1227714, 5-70067, 570067, 7-2551, 702551, AH2195198, EA2195198, PS2195198, Y702551. Whirlpool brands include Whirlpool, Maytag, KitchenAid, Jenn-Air, Amana, Magic Chef, Admiral, Norge, Roper, and others. Your satisfaction is our goal. We also carry a vast inventory of: main boards, switches, gaskets, motors, pumps and more. You'll find emerging technologies as well, because at the end of the day, we love what we sell. We were established to serve the needs of appliance repair users, and today we are one of the industry's top appliance parts product retailers. Our success has been built on a simple principle: take care of every customer like they were a member of our family. From the beginning, our top priority was to provide unmatched customer care and to help our customers understand how technology could help them. We've always invited intelligent, courteous men and women to staff our call center; to answer your questions, make recommendations and deliver solutions. We stock our inventory with the latest products, the best deals and plenty of information to help you decide for yourself. We are proud of each and every member of our staff, because they make the difference. Just because we offer guarantee lowest price doesn't mean we skimp on service. And we intend to continue serving you. The item "Genuine Y04100015 Jenn-Air Range Element Broil" is in sale since Sunday, December 14, 2014. This item is in the category "Home & Garden\Major Appliances\Ranges & Cooking Appliances\Parts & Accessories". The seller is "overdealz" and is located in Los Angeles, California. This item can be shipped to United States, to all countries in Europe, to Canada, to Australia, ZA, to Mexico, to New Zealand, SG, AE, MY.